The S9 is extremely well designed, but that doesn’t matter when your phone is about to smash into parking-lot asphalt. Even if your device survives the fall, a face-down trip to the ground can mar your screen with ugly scarring. It’s no wonder why the cell phone screen repair is a billion-dollar industry. Accidents happen, even when we’re terribly careful with our devices. And screen protectors are basic insurance against the kind of damage that seems almost inevitable when you spend a lot of time using your phone. 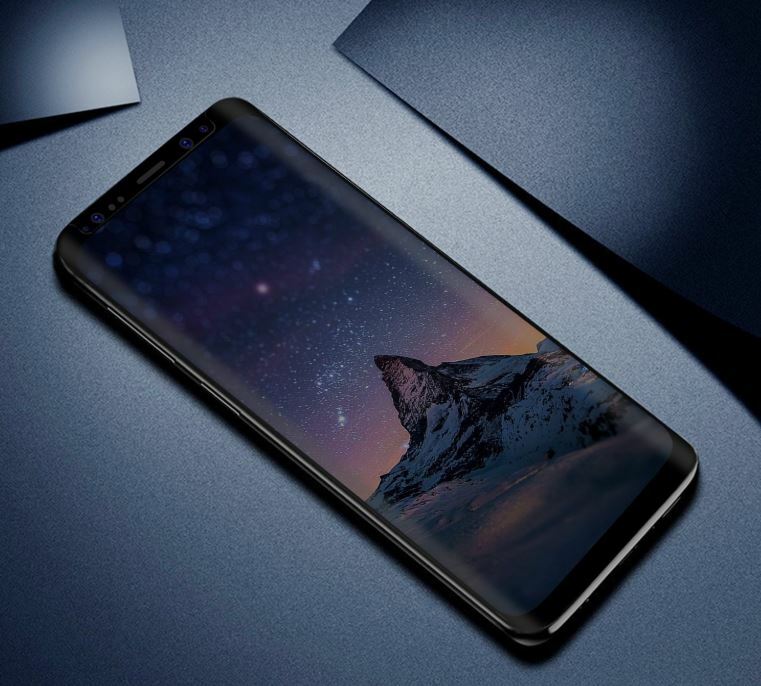 The front of the S9 is made of Corning Gorilla Glass 5, which is quite sturdy. It’s been specially built to be heavily resistant to scratches and cracks. And the S9 makes use of a reinforced frame, which is resistant to bumps and scratches even to the S8. That intense degree of protection is reflected in the IP68 waterproof rating of the phone. 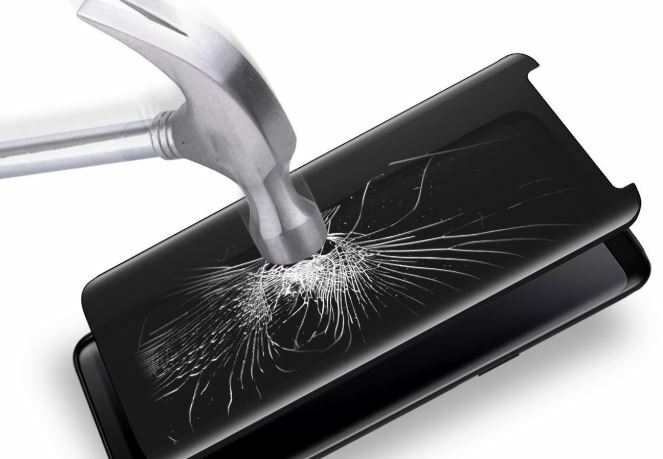 Clearly the S9 is well-built, but it’s not indestructible. A sandy beach would have no problem ruining the screen. And even if it’s not a matter of destruction or survival, screen protectors keep your screen looking its best. They can even add functionality that your phone lacks, like an anti-glare coating, a mirror finish, or a privacy finish. For protecting your phone from prying eyes in public, a privacy finish can help reduce the viewing angles of your screen. Screen protectors are made in two primary categories, glass and plastic. Polyurethane protectors tend to be cheap and lightweight. They’re ineffective against serious scratches and provide almost no protection against pressure. Worse still, plastic protectors can be fairly tricky to install, as anyone who’s had bubbles under their protector can attest. By contrast, glass is preferable for its protection. But it’s slightly heavier and slightly more expensive. Obviously a screen protector needs to be tough, and when you think of glass, the word fragile probably comes to mind. But correctly made, tempered glass can easily withstand small impacts and strikes. It’s also built such that if the glass is damaged or destroyed, the shards produced are less likely to cause injury. While you’re not going to find objective measures of toughness posted on manufacturing specifications, a good baseline to look for is 9H hardness. Glass which is rated for 9K hardness indicates it won’t get scratched by the toughness of a 9H pencil. The 9H is the toughest ordinary pencil. Although it’s not a fantastically useful test in real world terms, having 9H listed means the manufacturer bothered to test. It also gives you a rough idea of the protection offered. Do you get edge to edge coverage for your phone? Some glass protectors actually reduce the integrity of a phones protection by compromising the edge with adhesive. The most vulnerable portion of your phone are its corners. Your screen protector can survive a fall while your phone doesn’t, if your phone takes an impact the screen does as well because of its integration into the chassis. Protectors help for everyday scratches, and falls where your phone lands face-down. You’ve got to be able to sort through cheap knockoffs. 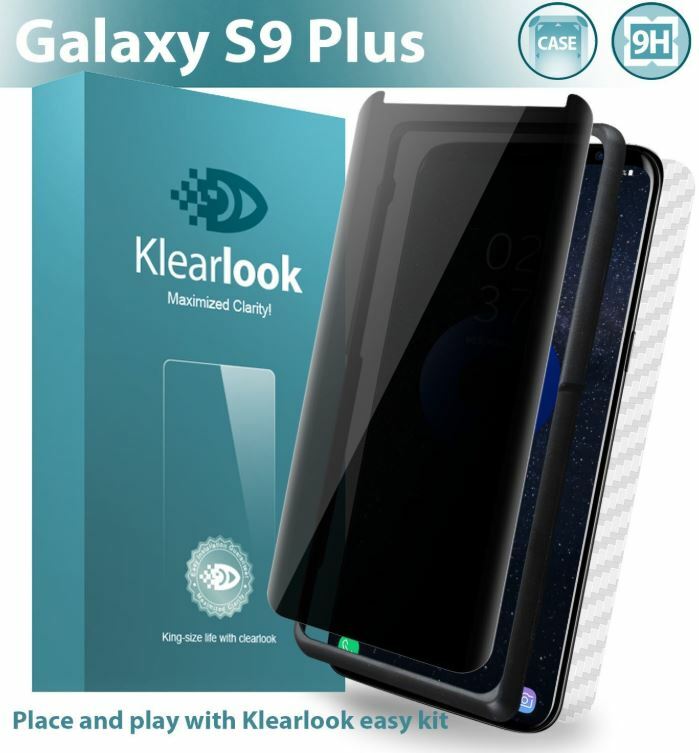 Some companies will sell screen protectors which are not built specifically for the S9, but advertise them as S9 compatible. And as you’d expect, you get mediocre fits out of those products. A mediocre fit provides mediocre protection, and may even reduce the sensitivity of your device. Touch sensitivity will be another large concern for anyone using a screen protector. Glass protectors can interfere with sensitivity because they’re adding more material between your finger and the underlying sensors. Many companies use an adhesive to attach the protector, which results in a screen losing sensitivity and being more likely to experience errors. This is generally avoidable by good manufacturing, adequate installation, and making simple adjustments inside your phone before applying the protector. Smudge resistance is another concern. The reason you’re using a screen protector is to ensure your display continues to look nice. Using a protector that attracts smudges can be every bit as annoying as scratches. Smudges that hinder screen colors are especially bad. You want a protector specifically designed for your phone, or else you’ll have to deal with cutting dimensions, or it won’t fit. That’s an even bigger concern when it comes to the curved design of the S9. But it’s worth your careful consideration. Selecting the right screen protector can sometimes save you from having to pay out more than $100 for a new screen. The LuettBiden protector was designed to be perfectly suited for the S9, including its 3D touch compatible technology. The resulting protection does little to detract from the original experience of using the unprotected S9. And along with the anti-scratch protection available with 9H tempered glass, you’ll get plenty of anti-spy protection. Even if you’re not good at applying screen protectors, this protector uses a bubble-free design that makes it easy to avoid problems. LuettBiden’s protector uses a standard 0.26mm thickness to their glass, which is enough to protect your device without drastically impairing the default sensitivity of your phone. Since it’s only a thin sheet of glass, adding this protector puts only 2 additional ounces on your phone. And the self-healing installation ensures that bubbles will be gone within two days. The design of the privacy screen allows for your screen to be visible within 90 degrees of direct on-looking. As far as protection goes, that’s fairly modest. People at drastic angles won’t have a good view of your screen, but you won’t have a hard time sharing your screen with a friend who’s standing next to you. This relatively narrow field of view could be described as a low level of protection aimed towards convenience. Some screen protectors require you to jack your brightness settings to compensate for dimness after adding a layer of protected glass. But 80% transparency ensures you only need a mild adjustment for this protector, which is excellent for your battery life. Includes a microfiber cleaning cloth and dust removal sticker. 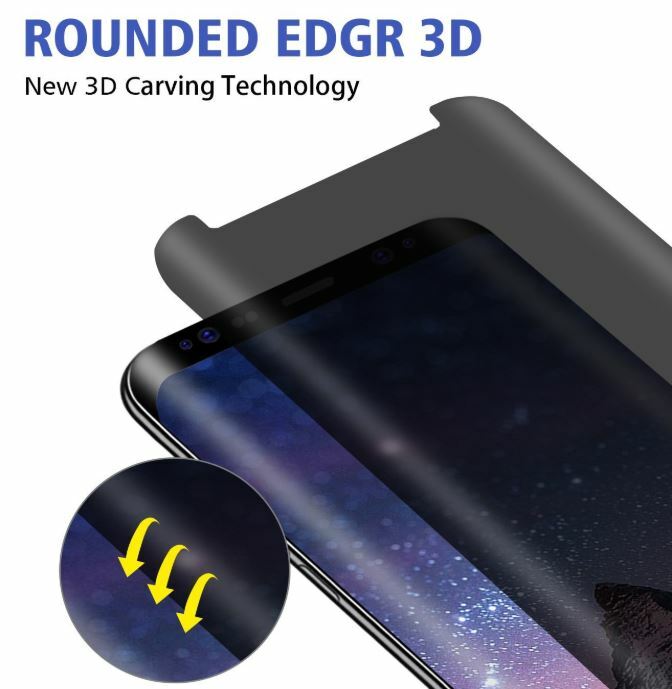 With the curved S9, you need perfect installation or you’ll have issues with recognition near edges. With a perfect installation, this protector leaves a gap that’s roughly 0.5mm on the edges of the screen. That’s not enough to cause a problem, however, if your installation is less-than-perfect, you may end up with a 1mm gap on either side of the screen. That being the case, your protection won’t be drastically impaired, but you might encounter sensitivity issues on that edge. Additionally, the cutout at the top can interfere with dropdown notification menu and bottom-slide menu. Klearlook’s anti-spy tempered glass protector has an extra-heavy helping of anti-spy functionality. The result is a screen protector which protects your screen and information equally. It’s case friendly design leaves extra space at the edges of the phone to avoid interfering with the screen protector. 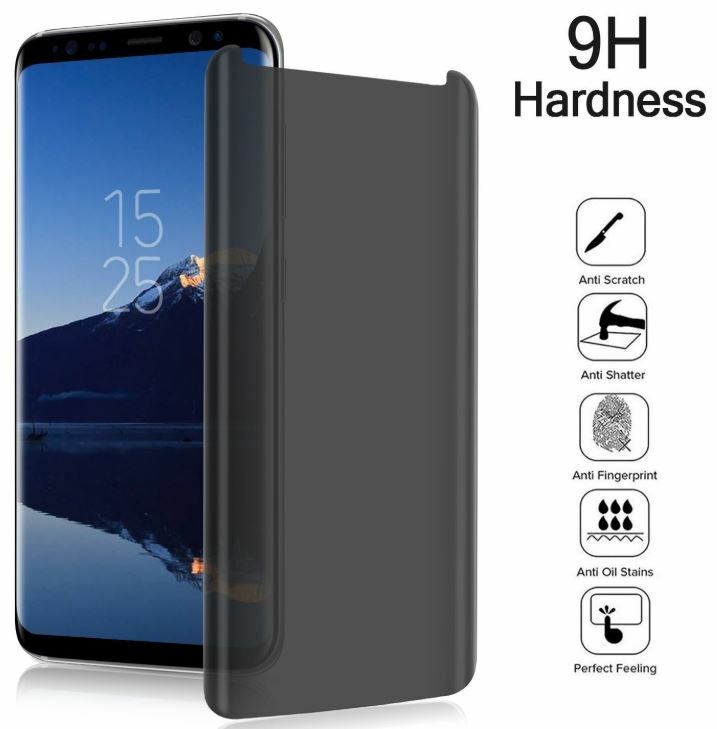 And this protector has been specifically made for the larger screen of the S9+, and carefully built to match its curved 3D screen technology. The Klearlook protector weighs about 3-ounces, which adds a barely perceptible amount of weight to your phone. 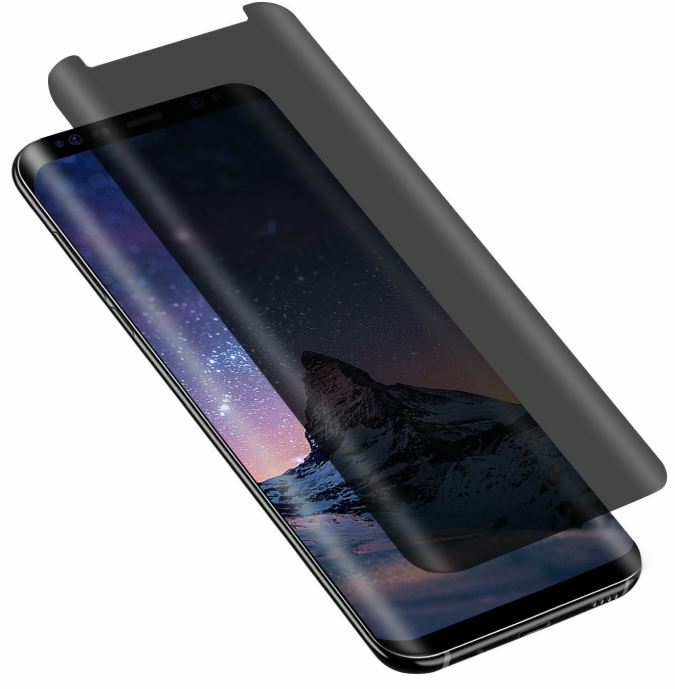 Part of the reason for the extra weight is this kit also includes a protective film which is intended to be applied to the backside of the S9. The film is fairly useful for protecting the body against scratches. Installation has been made error-proof with an aligning tool included in the kit, ensuring the process is simple and stress free. You’ll find adhesive glue is only on the edges of the protector, making for no risk of bubbles. As far as privacy goes, this protector provides a rather narrow 60-degree viewing angle. Screen becomes less visible, and ultimately black, as you get outside of that viewing radius. The resulting protection is more than enough to protect your phone from prying eyes. But if you need even more, you can reduce the brightness of your screen to lower effective viewing angles further. Apart from the glass protector and backside protector, this kit includes an alcohol wipe, microfiber cloth, and a dust removal sticker. That’s everything you need to clean and prepare your screen for seamless installation. But before you apply the glass, you’ll want to consider adjust the touch sensitivity of your phone to accommodate the change. 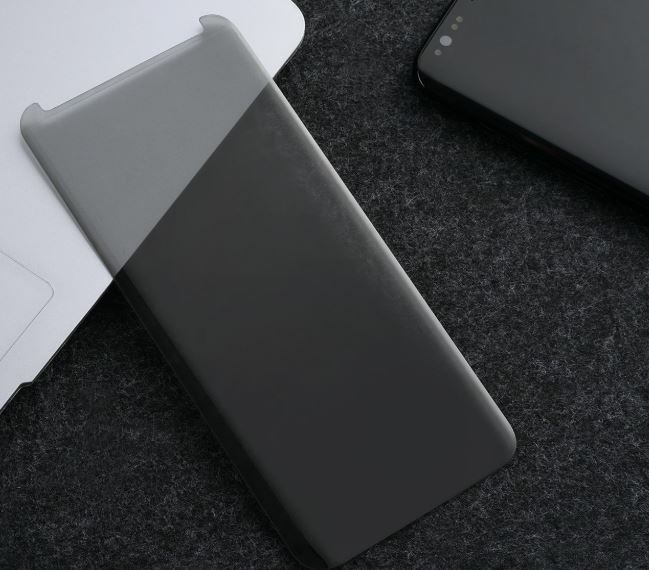 Specifically made for the S9, this privacy screen protector is built to fit on your phone almost invisibly. It has a much wider and more selective range of viewing angles than most screen protectors. Those extra powers are bundled with essentials like Arctic’s tempered glass and its 9H hardness. Whether you’re trying or protect from friction with keys in your pocket, or you’re worried about more serious types of damage, this screen protector has every base covered. Applying a screen protector can reduce the image quality of your display. And anyone who’s spent hundreds for a smartphone with an exceptional display would understandably be upset by that. 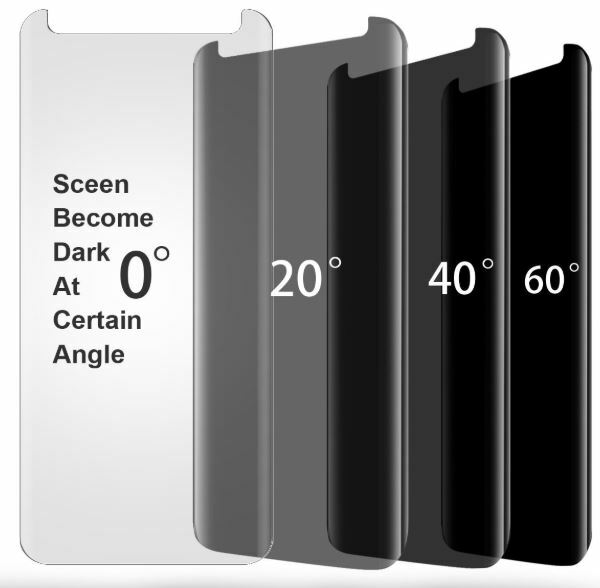 But the Artic S9 Tempered Glass Screen Protector provides 98% light penetration helps keep higher levels of viewing quality. Along with that, you’ll find this screen can be toggled between 90 to 30-degree visibility. That’s great for people who share what’s on their phone with friends at some times, and want to protect their display at others. Moreover, the standard 0.26mm thickness glass allows you to keep the native touch controls of the S9, and weighs the same 2-ounces you see from similar protectors. But like you’d expect, touch sensitivity issues may occur if you don’t adjust sensitivity before installation. Along with the glass protector, this kit includes alcohol wipe, microfiber cloth, dust removal sticker, and detailed installation instructions. To top it off, Arctic offers a satisfaction guarantee for replacement and refund. To do any better, you’d have to spend twice as much to get the comfort of a liquid screen protector. All in all, this is a highly cost effective kit. If you’re confident in your installation skills, then LuettbBiden is a good choice to protect your screen while keeping its original feel. 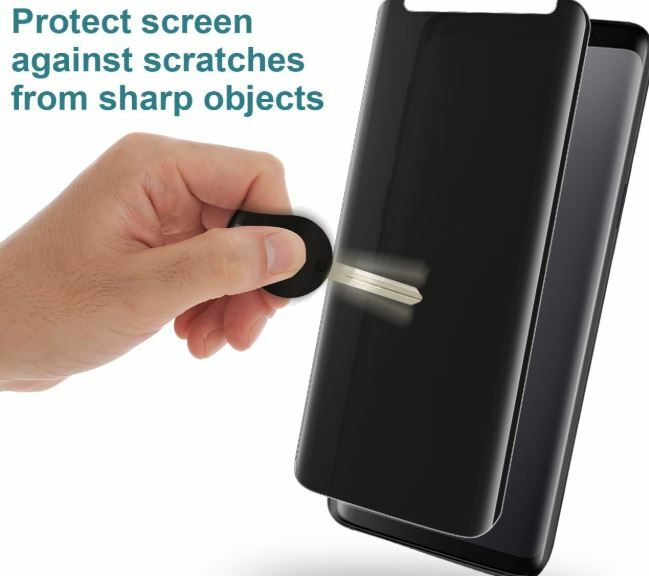 The anti-scratch, anti-spy protection is formidable, easy to install, and going to help provide more protection than the naked S9. While the wide 90-degree viewing radius isn’t going to block anyone and everyone from viewing your phone, it does provide a modest level of protection for people who are mostly worried about the prying eyes of distant strangers. 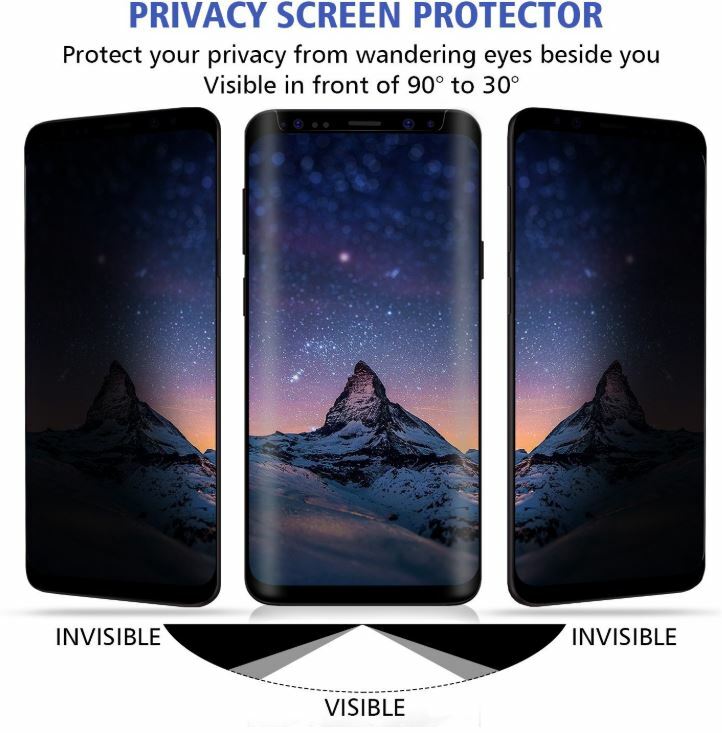 Klearlook’s S9 Privacy Defender is the protector you want for the larger screen of the S9+. The included backside film is a take it or leave it feature, but given how smart the S9+ looks, you might appreciate an added layer of protection. People who aren’t super confident in their ability to install a protector will love this protector because of the included installation kit. 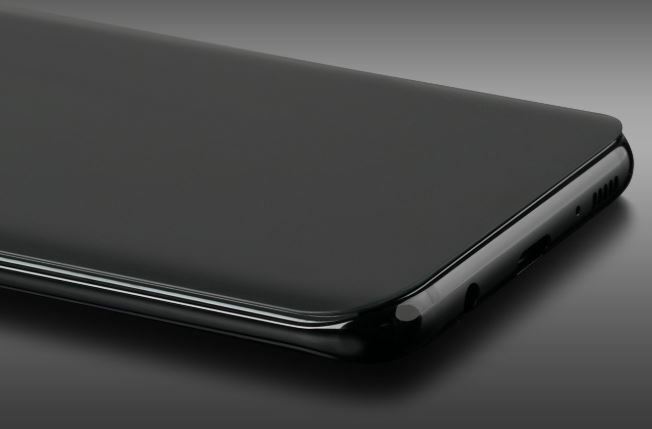 And the 60-degree viewing angles provide all the protection people look for from a privacy protector for the S9. The ARCTIC S9 protector is a basic and inexpensive way to add another layer of protection to your S9. If you’re worried about keeping the visual quality of the display in peak condition, then the 98% transparency of this protector provides security without hacking your colors to pieces in the process. Many people who would ordinarily go all-out on a screen protector will find themselves accepting more modest levels of protection. Corning Gorilla Glass 5 used in the S9 is formidable stuff to begin with. ARCTIC has an essential protector that you’ll be glad is there, which provides more than adequate protection at minimal cost.